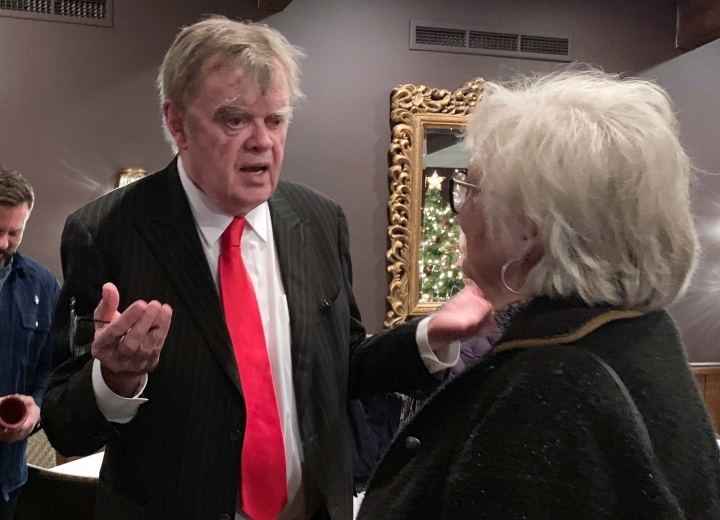 FRIDLEY, Minn. — Garrison Keillor looked comfortable on the small stage as he sang Christmas lullabies, told off-color limericks and spun a tale about a lutefisk dinner at the fictitious Lake Wobegon. Fans laughed, applauded and sang along throughout Sunday night's two-hour show — the second of back-to-back, sold-out Keillor performances at Crooners , a jazz nightclub in a northern Minneapolis suburb not far from where Keillor grew up. For Keillor, it's a much smaller audience than the millions of radio listeners he entertained on Saturday evenings during the heyday of "Prairie Home." But the nightclub show also represents a step into the spotlight for the 76-year-old Keillor a year after Minnesota Public Radio cut ties with him over a sexual misconduct allegation. Keillor retired as "Prairie Home" host with a final show at the Hollywood Bowl in July 2016 and turned the duties over to mandolin master Chris Thile, a regular musical guest who first appeared on the program as a teenager. MPR broke business ties with Keillor over a sexual misconduct allegation in November 2017. A former freelance researcher for "Prairie Home" alleged that Keillor had sexually harassed her, but Keillor maintains that sexually suggestive emails he had exchanged with her were simply "romantic writing." Keillor declined an interview request from The Associated Press. Becky Bierbaum, a 74-year-old fan from Mahtomedi, Minnesota, who estimates she has seen Keillor perform 15 times, said she is glad to see him again. "I think he'll be very well received by those who are devoted to him," Bierbaum said after watching Sunday's first show. On stage, Keillor did not mention the allegation that prompted MPR to cut ties with him after more than 40 years and to rename his former show "Live from Here." Keillor has since settled with MPR and now features old "Prairie Home" shows and "The Writer's Almanac," his daily reading of historic events and a poem, on his website . In October, public outcry over Keillor's scheduled appearance at a Vermont book festival prompted his appearance to be canceled . But Crooners owner Mary Tjosvold says Keillor's performances did not spark objections at her club. "I think people are happy to see him back performing. He's a performer. My feeling is, he's happy," Tjosvold told the AP. Both of Keillor's November performances at the club's smaller, 90-seat room sold out, so Crooners moved his December shows to the larger, 200-seat room, she said. Dressed in a dark pinstripe suit with a red tie and black dress shoes — not his signature red sneakers — and speaking in his lulling cadence, Keillor spoke of his exceeding the U.S. life expectancy in October, giving up drinking 13 years ago, growing up unsupervised and playing along the Mississippi River, being raised in a conservative religious household ("Every word you said should be to the glory of God") and listening to radio as a child. A shop teacher who caught Keillor cracking up a classmate with a limerick while Keillor was operating a jigsaw sent the future humorist to a speech teacher, who encouraged his breakthrough as a public speaker. Backed by former "Prairie Home" and "Live from Here" musical director Richard Dworsky on piano, Keillor sang solo and also warbled duets with singer Christine DiGiallonardo, a former "Prairie Home" regular. 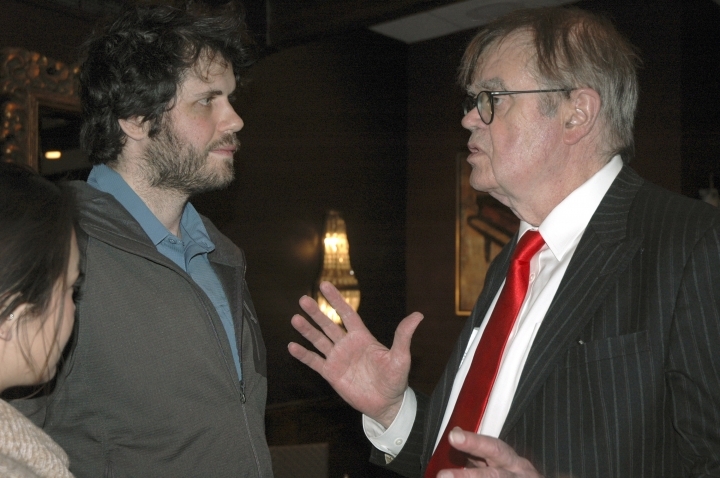 Keillor and DiGiallonardo exchanged lines on a parody of Bob Dylan's protest song "The Times They Are A-Changin'" with lyrics about an aging baby boomer bound for a nursing home. "So why am I marching with the AARP?" Keillor sang. Keillor talked about downsizing as he and his wife, Jenny Lind Nilsson, recently moved from their large St. Paul home to a condo near a hipster area of Minneapolis. His wife and their 20-year-old daughter, Maia Grace, were in the audience along with former "Prairie Home" voice actors Tim Russell and Sue Scott. "It was just great to hear his voice again," Russell said. "He's still got it. It's great to see him out there again, putting his toe in the water."